You are here: Home / Latest Posts / Honoring the Ultimate Sacrifice: Meadowbrook Post Office Dedicated to Lance Corporal Thomas Rivers Jr.
Thomas and Charon Rivers with U.S. Rep. Gary Palmer, right, who pursued legislation to dedicate the Birmingham Post Office Meadowbrook Station to Thomas Rivers Jr., who died in Afghanistan eight years ago. Journal photo by Ingrid Schnader. When Charon Rivers’ son, Thomas Rivers Jr., died in Afghanistan eight years ago, the one thing she wanted more than anything was for him to be remembered. Charon and Tom Rivers’ longtime friend U.S. Rep. Gary Palmer, R-Hoover, said he wanted to find a way to honor Thomas Rivers Jr.’s sacrifice. Palmer pursued legislation to dedicate the Birmingham Post Office Meadowbrook Station to him. That station was dedicated to Thomas Rivers Jr. during a ceremony Sept. 18. 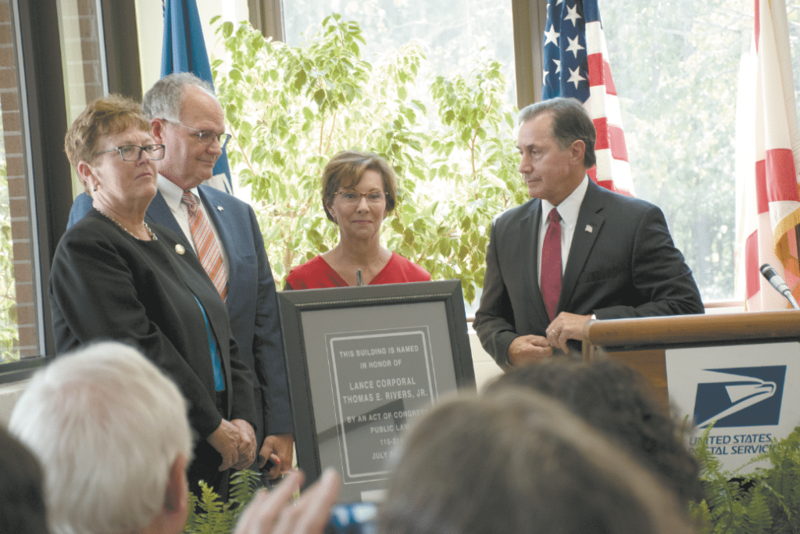 At the ceremony, Charon and Tom Rivers unveiled a plaque and photo of Thomas Rivers Jr. to be displayed in the post office. Thomas Rivers Jr. grew up in Hoover and graduated from Briarwood High School in 2007. Immediately following graduation, he enlisted in the U.S. Marine Corps. Thomas Rivers Jr.’s battalion deployed to Iraq in 2008, and he returned home seven months later. He was deployed again in March 2010, this time to Afghanistan. That next month, he was standing post to watch for Taliban combatants when he triggered a bomb and died. “I’ll never forget the morning that I got a call … that another sacrifice was laid on the altar of freedom,” said Palmer. Palmer was out of town when Thomas Rivers Jr. died, but he said he drove home to comfort the family. Thomas Rivers Jr. is buried at the Alabama National Cemetery in Montevallo. He was the first Alabama soldier killed in action to be buried there.